With more than 90,000 panoramic images, you can see the stunning Cambodian ruins up close from anywhere in the world ngkor, what remains of the capital of the Khmer Empire, is an incredibly beautiful place, but it's also very remote: tucked in the Cambodian jungle, at the intersection of jumbled ancient roads, its ruins remain off the beaten path and seemingly untouched by the modern world. Or at least it remained untouched until the 2000s, when the Cambodian government granted the oil company Sokimex rights to the money earned from ticket concessions to Angkor, and tourism to the ancient ruins skyrocketed—today, nearly two million visitors traipse over the temples' stones, causing irreversible damage to the site's foundations. Like Machu Picchu, once hidden from human view and then endangered by an influx of tourism, Angkor could eventually fall into complete ruin because of its appeal. 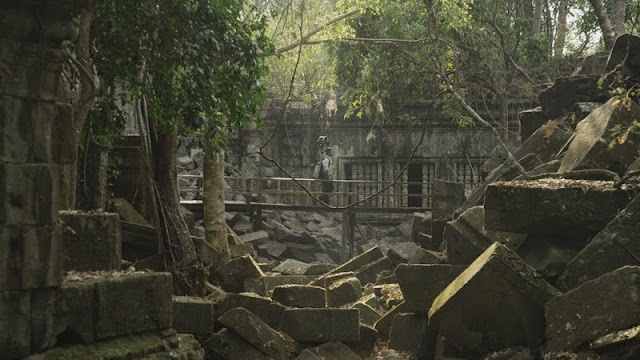 But now, those interested in exploring the wonder of Angkor don't need to make a trek to Southeast Asia—and risk contributing to the damage of the site—to enjoy what the ruins have to offer. 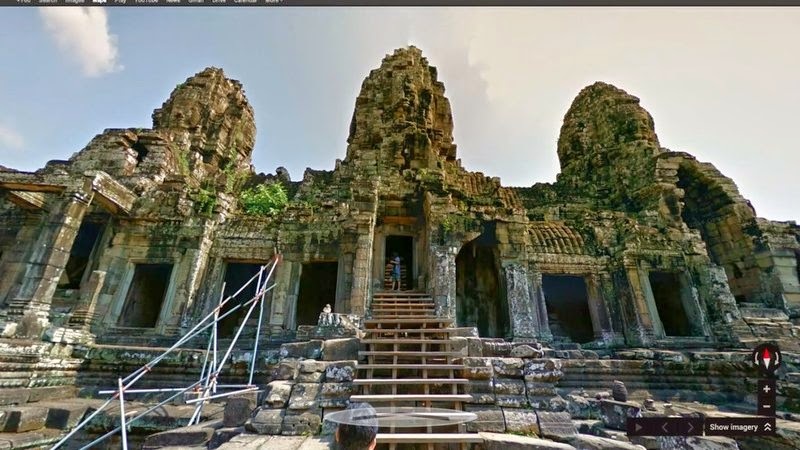 For the first time ever, Google Maps is granting users an up-close view of Angkor, through Google's Street View project. The move is an extension of Google Maps' mission to make sure that its maps are the most accurate, comprehensive and useful available to users. While to most people, this might materialize in the form of directions—using Google Maps to get you from Point A to Point B— the company doesn't see this as the limit for the product's technology. "Increasingly, if you look at the amount of power we have in our cellphones, the ability for those phones to know your location and customize an experience around you, they are becoming fairly good at making sure that people are able to explore the world around them," says Manik Gupta, Google Maps Product Manager. "We want to make sure that we have the ability to share all these places with users all over the world." Google Street View started in 2007, with the Street View car—an SUV with several computers in the back and a camera/laser apparatus strapped on top. Through the years, its technology has gotten more imaginative, using snowmobiles, trikes and trolleys with attached cameras to capture images. But in 2012, with the introduction of the Trekker—a backpack outfitted with a camera on top, complete with 15 lenses to take panoramic images—Street View could finally go off-road, bringing the world's most remote locations to users around the world. With the Trekker, the group has taken images of the Grand Canyon, the Taj Mahal and Venice. "We want to do this all over the world, wherever we can," Gupta says. "We want to bring the world, in all its glory to all our users, wherever they are." 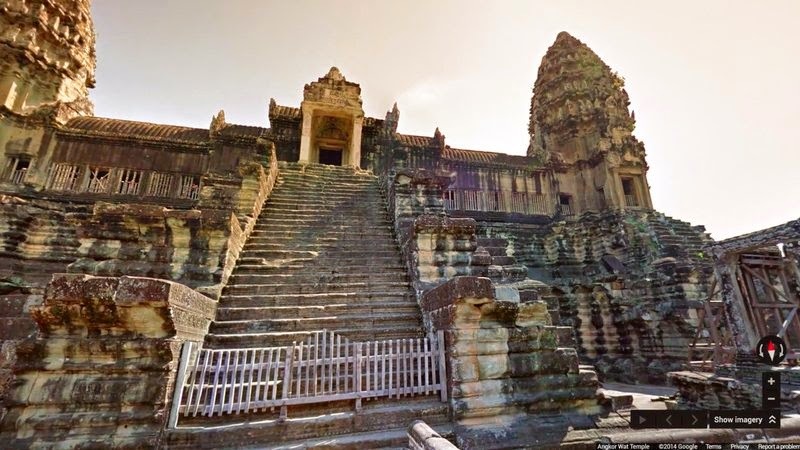 For the Google Street View team, mapping Angkor was a logical step in its mission to map the world's most amazing places. "Angkor is one of the most important sites in the world—people say it’s the 8th Wonder of the World—and it was obvious to us to start framing this project," Gupta explains. Google Maps worked in conjunction with the Cambodian Ministry of Tourism and the Apsara Authority (the body in charge of the protection and management of Angkor), which helped Google send people out to Angkor with the Trekker in order to capture the massive, nearly 250-square-mile ruined city. In order to create a Street View image of the expansive area, Google took 90,000 shots, all 360-degree views, of Angkors temples, which number more than 100. "It’s Cambodia sharing its culture with the rest of the world, which I think is pretty awesome," Gupta says.